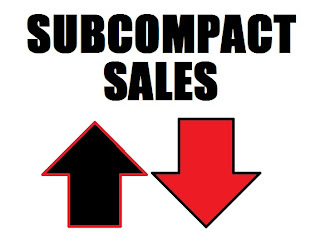 September proved to be pretty slow in the subcompact sales realm. However, there were a few big improvements over September of 2012. The not-long-for-this-earth MINI Coupe spiked up 258.%, the Mazda2 had a 153.4% jump, and the Toyota experiences its second month in a row of much-improved sales numbers. The also not-long-for-this-earth MINI Roadster had an impressive 87.1% bump, too. The Biggest loser, however, unsurprisingly, was Scions iQ, which was down 58% compared to last year. It is also down more than 50% year to date. Also in the slow-selling category is, surprisingly, Fiat's 500. Back to the not-surprising category, the Nissan Cube is also down . Nissan's Versa is coming out to be the best-selling small car on this chart, followed closely by Kia's Soul. In a relitavely distant third place is Chevrolet's Sonic.